Mastered by George Marino at Sterling Sound from the original analog master tapes to vinyl and PCM. The DSD was sourced from the PCM. George listened to all of the different A/D converters he had before he chose which to use, and he felt the George Massenburg GML 20 bit A/D produced the best and most synergistic sound for the project. 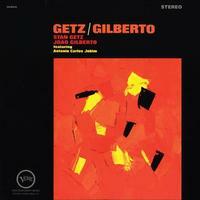 Astrud Gilberto says that her husband, Joao, informed Stan Getz that she "could sing at the recording." Creed Taylor recalls that it took Getz's wife, Monica, to get both Astrud and Joao into the recording studio; Mrs. Getz had a sense that Astrud could make a hit. And Getz himself is on record saying that he insisted on Astrud's presence over the others' objections. So who's right? What does it matter? The Gilbertos, Getz and the legendary Antonio Carlos Jobim followed up the bossa nova success of Jazz Samba with this, the defining LP of the genre. With one of the greatest hit singles jazz has ever known - each one who hears it goes "Ahhh!"